Our November 2009 issue exclusively revealed that the standard reference books on BR steam loco disposals contain many errors. Since then there have been several interesting developments, as ROGER BUTCHER reports. THE aim of the HSBT Project is to leave for future generations a totally correct record of the fate of all the steam locomotives that existed in the last 12 years of the British Railways steam era. Named after the four men who established it – Terry Hayward, Richard Strange, myself and Peter Trushell – the project was launched in 2009 after it was realised that the definitive reference work on the subject – the ‘What Happened to Steam’ series, published in the 1980s – contained serious errors. What has been the response to the project? Fantastic! Many enthusiasts, who simply could not understand why their own observations were at variance with published material, have thanked us for bringing the matter to public notice. There has, however, been a degree of embarrassment from certain writers and publishers, who for many years have been relying on the What Happened to Steam (WHTS) books and find it hard to accept that their own books now also contain inaccurate information. To view any above documents full screen, click on the image. I have seen it suggested that more than 2,500 entries in the WHTS books were wrong and may even have been deliberately falsified. Is that correct? 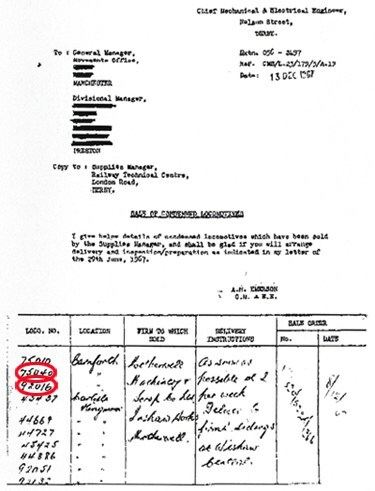 The centre panel above shows just one column – in his own handwriting – from the 2,500 fabricated entries ‘Zulu’ supplied to Peter Hands. Fortunately, the official BR documents shown either side illustrate the quality of the information the HSBT Project has been able to obtain. In this article we feature three locos photographically (63346, 65833 and 65892 at Clayton & Davie, circled in green) and three by official documentation (75040, 75042 and 92016 sold to Motherwell Machinery & Scrap, circled in red) that show ‘Zulu’s information for what it is - fantasy! We have yet to find any evidence to substantiate any of the other entries in the above sample list. We are indebted to the Derby Industrial Museum for making the official documents available. 2,500 entries in the WHTS books were wrong and may even have been deliberately falsified. Is that correct?Unfortunately yes, but that was not the fault of the compiler, Peter Hands. Our investigations have revealed that he was supplied with false information from a correspondent, which he accepted in good faith. One can sympathise with Peter that his trust was betrayed. Have you been able to identify the correspondent responsible and, if so, have you been able to trace him?Yes, he lives in Northamptonshire. How can you be so sure he was the culprit?Because the HSBT Project has obtained a file containing the fabricated information sent by him to Peter Hands in the 1970s (see above). Have you contacted this person and can you name him?Yes, I have managed to track him down and have spoken with him at length. He is an articulate man but a fantasist. The HSBT Project has nicknamed him ‘Zulu’, but why is a story for another day. Considering the damage he has done to railway history, surely some action should be taken against him? It is our belief that there is little point in pursuing him any further. It is Peter Hands who is the real injured party. We simply need people to appreciate that so much information in the books was fabricated and why it is essential that we go back to square one. Which BR Regions contain the most fabricated entries?The Eastern and London Midland Regions. Are the BR Standard locomotives affected by this fabricated material?Yes, for example, a total of 21 Class 9F disposals has been falsified. What is the situation with the Western Region?There are errors but, fortunately, an amazing amount of primary information has been made available to the Project by The National Archives at Kew and we have also obtained a copy of a register detailing the scrapping dates for Swindon Works. Do you have information for other BR works?So far we have obtained cutting-up books/records/data for all the Southern and Western Region workshops. Similar records have been made available to the project for Crewe, Gorton and Horwich whilst data for Darlington and Doncaster has just arrived and will be examined shortly. How about the Scottish workshops?Scotland is, so far, the HSBT Project’s ‘black hole’. The majority of information obtained so far has come from English-based enthusiasts. Our intention is now to start approaching Scottish railway societies direct. How does the WHTS information compare to the workshop data you have received? There are many discrepancies – a significant number of which originate directly from the falsified information supplied by ‘Zulu’. You mentioned in your first article that the dating of locomotives being scrapped was a major problem. Can you expand on this? Almost every author and website likes to specify the month of scrapping. All very neat and tidy, but if you look specifically at the foreword of each of the WHTS books, it clearly states “With reference to the column ‘where scrapped’ the works dates are actual cut-up dates, but where the locomotives were sold to private contractors it is often the case that these were the dates the locomotives were purchased’. So, they are not actual scrapping dates and do not claim to be, although obviously if you do not read the foreword then you are left with the impression that they were. So, where have all the websites got their disposal information from? We have yet to find a website that contains primary information that can be relied upon. Every site we have examined appears to be based on the WHTS books and, therefore, perpetuates the original errors. If there is a website out there where this is not the case, please get in contact with us and we will mention it in The Railway Magazine. We accept that, after three decades, it is going to be extremely difficult to break the cycle of misinformation out there. 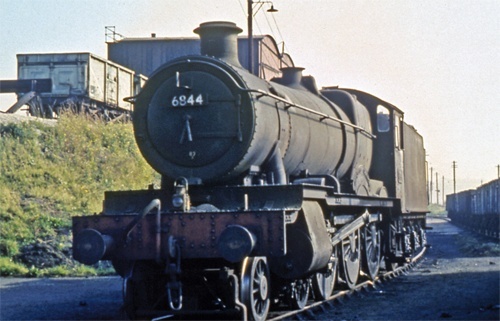 For example, we recently checked for another magazine a list of locos known to have been scrapped by Cohen’s of Kettering and, within days of the magazine being published, we began to receive letters asking why a number of locos had been ‘omitted’ from our list. Those, of course, were the locos ‘Zulu’ had made up – but the letter-writers were still not aware of that and had been treating the WHTS booklets as ‘gospel’. We have a very tough job ahead of us. What progress has been made in breaking the circle of a continual perpetuation of errors?Discussions with the major railwayana auction houses have resulted in Great Central Railwayana Auctions being the first to use HSBT storage and disposal information in their catalogues and my thanks go to David Jones and Mike Soden for their support. You obviously are very critical of how few authors go to the trouble of accessing primary sources and instead rely on re-hashing or copying material already published. Which primary sources is the HSBT Project relying on? Engine History Cards (held at York and Edinburgh). Engine Record Cards (at York and Kew). Engine History Sheets (at Kew). Engine shopping records for ER-owned locomotives (at York). BR Special Traffic Notices, containing dates and other details of locomotive movements to breakers. Sales and movement correspondence deriving from Rolling Stock Control/Sales offices. Private breaker records (e.g. Cashmore). Cutting records compiled privately from breaker records and subsequently published (e.g. Draper). Receipt and disposal information in letters from breakers (e.g, Hughes Bolckow). Documents in The National Archives at Kew numbered in the Rail 254/512 series (WR sales). Various other Rail 254 sub-categories at Kew, which advise works disposals and dates for WR and SR locomotives. Horwich Works cut book, compiled from official records. Official records compiled at other works. Various shopping records, which also offer dates of taking into workshops for cutting up (ex-LNER). Contemporary notes made by observers at the time, along with dated photographs or cine film taken on sheds, works, storage sidings and breakers’ premises. Your first article mentioned a list of railway societies that had pledged assistance. Have any other railway societies got involved? Yes, the list is growing and I would like, in particular, to mention the RCTS. 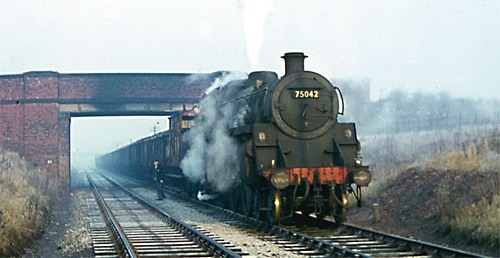 An initiative has recently been launched in which member John Aitchison is aiming to co-ordinate responses from each of the society’s 30 branches, the idea being for each branch to nominate a co-ordinator for the collection of data on the storage and disposal of steam locomotives during the 1957-1968 period. 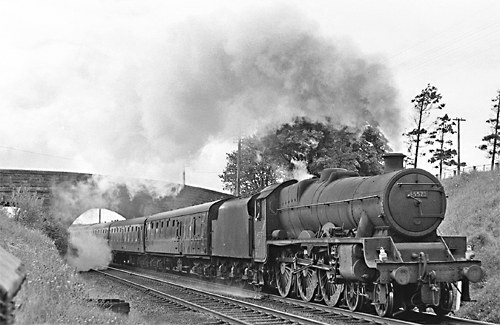 Have you considered accessing information from some of the smaller railway societies that existed in the 1950s and 1960s? 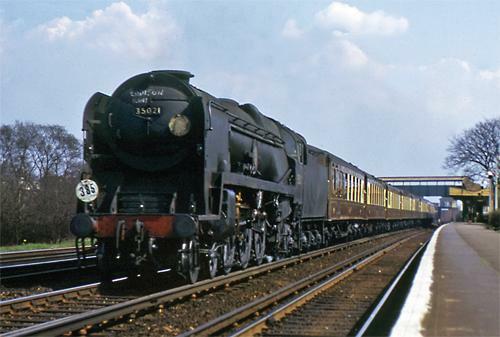 Yes, John Redgate, the RCTS chairman, and Andrew Lait, from Canada, have both mentioned the potential usefulness of the lists of stored locomotives published by the British Locomotive Society between March 1963 and December 1966. These lists were made available for an additional subscription and detailed stored and withdrawn locomotives at sheds, scrapyards and other locations. John is very kindly providing copies for the HSBT Project but does not possess numbers 2 and 3 (April and May 1963). Can anyone make these available to us please, even if only on loan? What do you think when you see a statement like that? The reality, of course, is that there were contractual documents for all asset sales. The myth that locomotives were “often” resold is simply an excuse to try to explain the fabricated entries. When can we expect the HSBT Project to make the results of its researches available? As emphasised in last year’s article, whilst we anticipate publishing regional disposal books, we will not do so until we are satisfied that all available sources of information have been examined. In the meantime, the team will consider assisting publishers and other providers of information with specific data to ensure its accuracy. When can we anticipate seeing the next update on the HSBT Project in The Railway Magazine? Early next year. That update will be extra special, for it will include the first published list of the locomotives whose fate we have still been unable to establish – and for which we will need the help of readers. In addition, we will announce the anticipated publication date of the first of our planned books on the withdrawal, storage and disposal of the steam locomotives that existed in the last 12 years of the BR steam era. Are there any other points you’d like to make? I would like to record my appreciation to everyone who has got in touch with us. There are too many to mention but I would, in particular, like to thank railway scrapyard experts Ashley Butlin, David Dunn and Tony Wakefield for pledging their support. I would also like to welcome John Aitchison (notebook research) and Richard Morton (Sheffield area scrapyards) to the HSBT Project team. Thanks also to Railway Magazine editor Nick Pigott and deputy Chris Milner for their invaluable help and support in launching the project. Thanks are also due to my colleagues on the team, who are working hard and whose contact details can be found below.